Unity in Dallas was first organized in 1942 by Licensed Unity Teacher, Dr. Ruth Gillespie. Their first home was a rented, one-story, downtown Dallas building. Their first job was to paint, refinish floors, install partitions and buy furnishings. In 1943 Cora Crandall visited the center to pray. As she left, she met Dr. Gillespie, who soon afterward offered her an unpaid position as assistant. Cora accepted. Then the lease ended and they moved with more renovation and the addition of a bookstore. Dr. Gillespie was ordained a Unity minister in 1945. Cora Crandall became a Licensed Unity Teacher in 1949 and was ordained in 1952. During their ministry it was never easy to be two women minister in a city that knew only male ministers. Yet they kept the faith; and the congregation steadily grew. In 1950 they found and bought a dilapidated church building at the corner of Greenville and McCommas Avenues. After the down payment was pledged in a single congregational meeting, they did the renovations. One couple made new mahogany doors, another carpeted the floors and another bought antique walnut pews from an old downtown church (the pews are still in use). Members purchased new sanctuary windows. In great joy the church was dedicated October 3, 1952. Dr. Gillespie and Dr. Crandall retired August 1, 1970, succeeded by Dr. Donald Curtis, who merged his Science of Mind congregation with Unity. Dr. Curtis was a dynamic speaker and the church outgrew the space and moved to the present site of Unity Church of Dallas on Forest Lane. Soon, however, a group yearned for the small, intimate environment of the old building and returned to it and incorporated Unity Way Church on February 19, 1974. The renewed congregation's first minister was Rev. Jack Hamilton. When he left in November, 1978, church members Margaret and Frank Pounders--both Licensed Unity Teachers--became co-ministers. Ordained as Unity ministers later, the Pounders served the ministry until their retirement in June, 2005. During the Pounders term of service as co-ministers, the church grew to approximately 700 members and friends. To accommodate growth, the congregation tried moving a couple of times, but members missed the old building and returned. A nearby doctor's office was purchased and renovated in 1990 for use as church office and classroom space. In 1993 a 3,100 square-foot two-story addition was built to provide an enlarged sanctuary and a fellowship hall. Rev. Terry Dearmore served as minister for six months in 2005 followed by Rev. Steve Colladay, who served as minister from 2006-2013. Rev. Karen Romestan now serves as our minister. 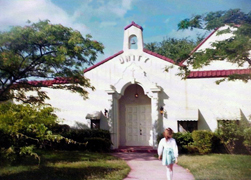 In 1988 the name of the church was changed from Unity Way Church to Unity Church of Christianity of Dallas. Today it remains on the corner of McCommas and Greenville Avenues, right in the heart of what has become a lively, growing area of small businesses, restaurants and nightspots. Many have been first drawn to "Unity on Greenville" by its atmosphere of tranquility in the midst of the street's bustle. Since 1942, Unity Church of Christianity has served the spiritual longings of Dallasites with its positive and uplifting message, and the church is currently experiencing a rebirth of energy, commitment and excitement as we move into the new millennium. -- Adapted from Unity Wings Across Time, 2001. Unity helps people around the world through prayer, publishing, and education. Unity has been teaching the lessons of Jesus for more than 100 years. Unity Village, Missouri, (15 miles southeast of downtown Kansas City, Missouri) is home to Unity School of Christianity. The Mediterranean-style buildings and grounds are beautiful. When you visit, you will find flower gardens, fountains, and nature trails. Unity is a place where people come to enjoy the beauty of nature and learn about themselves. See how Unity and Kansas City fit together. This time line takes you down "memory lane" more than 100 years. Mary Caroline Page is born on August 6 in Pagetown, Ohio. As a small girl she adopts the name Myrtle. She wants to be a schoolteacher when she grows up so that she can teach children to make the world a better place. Charles Sherlock Fillmore is born on August 22 in St. Cloud, Minnesota. He grows up curious about many things. He reads classic authors like Shakespeare, Tennyson, Emerson, and Lowell. He works hard as a printer's helper and later as a grocery clerk and in a bank. Then he moves to Texas and works with the railroad. Myrtle goes to Oberlin College in Ohio. She studies the "Literary Course for Ladies." The classes last only one year. During this period in history, women were not allowed to go to college for four years. After Myrtle graduates from college, she moves to Texas to be a schoolteacher. Charles meets Myrtle in Texas, and they get married in 1881. In 1884 the Fillmores move to Kansas City, Missouri. Charles sells real estate. Myrtle gets very sick. She thinks there is nothing she can do about it, because she has been sick since she was a little girl. Charles and Myrtle go to a class taught by Dr. Eugene B. Weeks. Myrtle leaves this talk with a stronger faith in God and a new way to pray. She says, "I am a child of God, and therefore I do not inherit sickness." When she says this, she believes she is going to get better. Within two years, Myrtle does get better. Her family and friends are excited, and they start praying too. Charles continues studying world religions and philosophies. He also studies the link between religion and science. Charles and Myrtle start writing about their beliefs, and shortly thereafter Unity is born. In April the Fillmores publish the first issue of Modern Thought, a national monthly magazine devoted to spiritual questions. The magazine's name is eventually changed to Unity magazine in 1894. Charles chooses Unity as the name for the movement they are founding. Myrtle starts Wee Wisdom, a monthly magazine for children. She is editor for many years. Wee Wisdom is the oldest continuously published children's magazine when discontinued in 1991. Lessons in Truth by H. Emilie Cady is published as the first Unity book. Over the years it is translated into 11 languages, is published in braille, and sells more than 1.6 million copies. The Unity Society of Practical Christianity is incorporated as the first Unity church. The Fillmores start Unity School of Christianity to handle their publishing and educational work. Unity Society of Practical Christianity continues the church functions of Unity. The first 58 acres of the present Unity Village site are bought in eastern Jackson County, Missouri. Many buildings are developed in the next ten years, but construction stops during the years from the Great Depression through World War II. In 1945, other buildings are built. Unity becomes a pioneer in radio broadcasting. Charles gives his first Unity lesson over radio on station WOQ. This has been documented to be the first radio presentation by a clergyman in Kansas City, Missouri. The station is later purchased by Unity, but eventually sold in 1934. The first issue of Unity Daily Word (renamed Daily Word in 1939) is published in July. Frank Whitney is the first editor. Unity buys the land where Unity Temple on the Plaza will be built in 1948. Charles uses a shovel to break the ground and bless the site of the future church. The 165-foot-tall Tower and the Silent Unity building (later to become known as the Education building) are constructed at Unity Village. The Tower contains a 100,000-gallon water tank that provides fresh water. The Tower also houses a carillon that chimes music at different times of the day. In 1989 these buildings are put on the National Register of Historic Places. Myrtle Fillmore makes her transition. She is 86 years old. People call her the “Mother of Unity.” She saved many of the letters she received. She also saved copies of her responses. Her responses are about the healing power of prayer. Her beliefs are the foundation of Unity today. Charles retires from the pulpit of Unity Society of Practical Christianity. He continues as president of Unity School of Christianity. Charles marries his second wife, Cora Dedrick. The next 10 years he spends a lot of time traveling and speaking to groups of people. The Heritage Room library is started (renamed Unity Archives in 1997). Later a circulating library is started. The Library is open to the public today. The Library has a lot of books, magazines, cassette tapes, and videotapes about the Bible, world religions, and spirituality. Unity School moves from downtown Kansas City to a site near Lee's Summit, Missouri. It is called Unity Farm (renamed Unity Village in 1953). Orchards with apples and peaches are grown at Unity Farm. Also there are vineyards and a dairy. People from all over Kansas City come to Unity Farm to buy fresh vegetables and milk. Charles Fillmore makes his transition. He is 94 years old. His son Lowell becomes Unity School's president. The first spiritual retreat is held at Unity Village. Today there are about a dozen retreats a year that adults can come to, including Spanish-language retreats. Unity’s Rose Garden is started. Today the garden has 800 bushes, with nearly 50 different kinds of roses. Wee Wisdom School, a Montessori preschool, is started. Its name comes from the children's magazine of Unity, Wee Wisdom. Although Unity School's preschool closes in 1982, many Unity churches still have Wee Wisdom Montessori preschools today. Unity Village becomes a city in Missouri. It is located between Lee's Summit and Raytown, Missouri. Unity's first television program, “The Daily Word,” is started by Rosemary Fillmore Rhea. Rosemary is the granddaughter of Charles and Myrtle Fillmore, cofounders of Unity. The Department of World Unity (renamed International Services in 1997) is started. It works with other Unity ministers and ministries in other countries around the world. The Association of Unity Churches is officially organized. It supports other Unity ministers and ministries in the United States, Puerto Rico, and Canada. The Unity Institute for Continuing Education (renamed Unity School for Religious Studies in 1980) starts so adults can take spiritual classes. “The Word” makes its first appearance on television. Many people see these programs, which present movie stars reading Daily Word. The programs stop in 1992. The Unity Visitors Center staff starts giving tours of Unity Village. They give free tours throughout the year. Unity celebrates its 100th birthday (its Centennial). The Unity School of Christianity Historical District is placed on the National Register of Historic Places. Connie Fillmore Bazzy, Unity School's president, opens a new Silent Unity building so the work can grow. A Spanish-language Continuing Education Program is started. People who speak Spanish come to Unity Village from all over the world to study the Bible and other spiritual subjects. Unity’s first World Day of Prayer is organized. On Unity’s World Day of Prayer, more people contact Silent Unity for prayer than at any other time. Unity's World Day of Prayer is on the second Thursday in September each year. The first Unity World Conference is held in Birmingham, England. People from around the world go to England for this conference to learn about Unity's work. You may ask someone at Silent Unity to pray with you by calling 1-816-969-2000. Or you may submit a prayer request online. Either way, it is free. And it is always kept private. Silent Unity does not give advice. Silent Unity prays to God with you like a friend would pray with you. The second Unity World Conference is held in Acapulco, Mexico. Unity dedicates its new labyrinth-a spiritual tool for walking and meditation. It is patterned after a famous medieval labyrinth that was carved into the stone floor of Chartres Cathedral in France around 1200 A.D. The labyrinth at Unity is open to the public during daylight hours and is designed to accommodate wheelchairs.